Los Angeles-based KBMD is wrapping up production of the hotly anticipated new album Kill Zone, due for release in April. Kill Zone will be available online in April 2012. The Kill Zone is a state of mind. It’s about doing whatever you have to do to win. Los Angeles hip-hop producer Jamal Weathers is putting the finishing touches on the new album from Kush Boys Music Department (KBMD). The album, called Kill Zone, features inspirational tracks by a number of experienced hip-hop and R&B artists. Kill Zone will be available online in April 2012. The record’s strong, driving hip-hop beats are designed to inspire listeners to take action and always keep their eyes on the prize. Kill Zone is an anthem to those who do what it takes, whether they’re on street corners or in corner offices. Artists including Lucky Lamar, Dread Tha Ol’ Head, Brotha Rahim and J. Monk aka Baby Paw are in top form, displaying all the expertise and precision they’ve gained from years in the industry’s trenches. Kill Zone will be available for sampling and download on iTunes, Amazon, and Rhapsody. 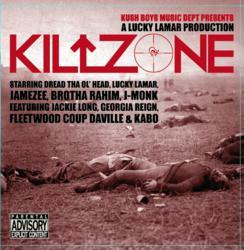 Kill Zone will be the second hip-hop album from KBMD, following last year’s hit record Tha Kushilation. The inspiration for the new album came from the attitude of all the collaborators who worked together on Tha Kushilation. The album’s executive producer, Jamal Weathers, a native of Los Angeles and co-founder of Kush Boys Worldwide, brings a diverse professional background to the creation of Kill Zone. He started acting at age seven, and has acted in a dozen films, including Belly 2, We Own the Night, Shooter, Four Brothers and I Heart Huckabees. Weathers has also worked with Mark Wahlberg as a reading consultant on numerous films, modeled clothing for leading brands including Nike, Karl Kani, Mecca, and Helly Hansen, and co-managed the musical group Stepchild, which signed with Warner Bros. in 1995. He toured with D'Angelo and Prince with Stepchild. For more information about Jamal Weathers, visit http://www.imdb.com/name/nm1080067/. For more information about KBMD or Kill Zone, call (310) 880-8179 or visit http://www.kushboys.com/kbmd. Kush Boys Worldwide is a Los Angeles-based company committed to pursuing ventures that benefit a demographic they call the new-age pop culture. Current projects include the online animated series Master Kush; an eco-friendly clothing line for the urban demographic called Kush Couture Lifestyle Apparel (KCLA); an all-natural iced health tea made with hemp known as Chronic Ice; the natural male enhancer Sir Rock; and hip-hop production company Kush Boys Music Department (KBMD). Kush Boys is now launching a number of lifestyle products, such as Chronic Ice and KCLA clothing, to satisfy the needs of a demographic they call the new-age pop culture.